Garage door springs are separated in two categories. They are either installed around a horizontal shaft over the door and turn along that longitudinal bar creating torque or are mounted along the horizontal tracks at the two sides of the door and their job will be to stretch and retract. 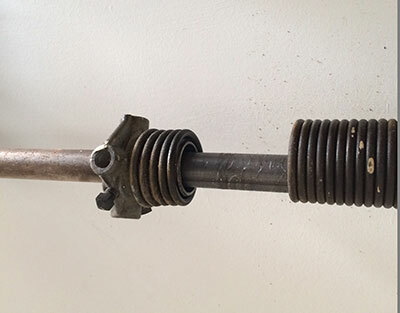 The former is called torsion spring and the latter extension springs for garage doors. Torsion springs are usually ideal for heavy doors and extension springs make sure the door is counterbalanced. That's why the sum of the power of each of the two extension springs must be equivalent to the weight of the door. If the door weighs two hundred pounds, each spring must have equivalent force of one hundred pounds. Such details are important so that the door will move properly. Garage Door Repair Blaine never misses to take into consideration every detail about springs. These are essential components of the system and we make sure our customers choose the right springs when they need to replace the existing ones for any reason. We can measure them and understand what the right size spring you need is just by knowing the measurements of the overhead door. We have expert garage door repair spring specialists in our company and glad to assist you any time you have questions or need answers. Our services are fast and provided on a same day basis. When you have urgent spring problems, you can count on us. We have the perfect emergency teams in terms of time of response, knowledge, courtesy and experience. When you want garage door spring replacement, you can depend on our ability to carry out the service with perfection. We install, replace and adjust all types of springs and try to be as fast as possible when problems get out of hand. Garage Door Repair Blaine is a really caring contractor. We understand that overhead door springs issues are not innocent and spring repairs must be done fast. We can assure you that we will be there when you want any service related to garage door springs. Contact us for your problems via phone or email.